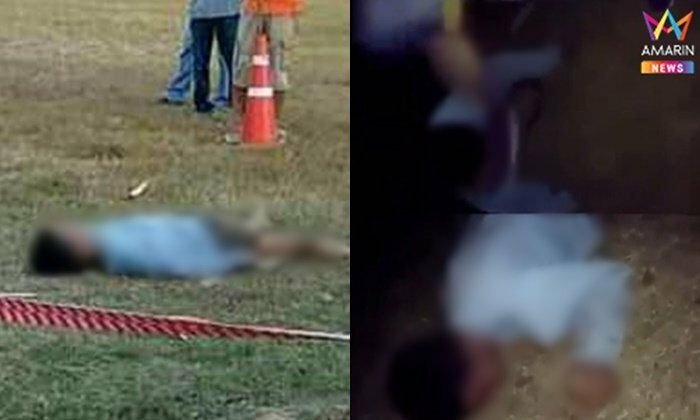 Sanook reported that a gang of six young men were paid just 5,000 baht to murder a 17 year old at a school football pitch in Khon Kaen. The orders came from a man known only to the gang as “Thep So-Lo”. He ordered the hit via Facebook and demanded that a video be taken to prove what had happened. The suspects in custody – whose ages range from 16 to 23 – have told police that the hit order came from a man they didn’t know but who was not paid for drugs dealt by the victim. The victim was 17 year old Kurusat who has been named under the moniker “Red Ban Toom” in the media. All the suspects have been charged with premeditated murder. Two guns, two Sparta knives and a broken baseball bat were found at the home of a 37 year old man who was not involved in the murder, reported Sanook. These items are now in the possession of the Khon Kaen police. A clip has shown feet and hand held weapons being used in the gang attack earlier this week at a well known but unnamed school at night. Meanwhile two of the suspects named only as “Bas” and “Ball” have said they were invited by elder friends to take part and felt pressured by Thai cultural mores (graeng jai) to go along. They said that they only did one kick each and it was their understanding that the victim was just going to be given a “warning” but not murdered. They apologized to the victim saying it was a mistake to kill him. They believed that when they left the scene the victim was still looking up and alive.